How Women Are Harassed Out of Science (Joan C. Williams and Kate Massinger. The Atlantic Jul 25, 2016 )The discrimination young researchers endure makes America’s need for STEM workers even greater. How Sexual Harassment Halts Science (By Vince Grzegorek July 19 2016 1:01 PM slate.com) Recent reports have revealed how rampant sexual harassment is in the astronomy community. What’s to be done? 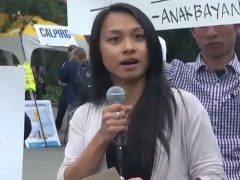 UC Berkeley graduate student instructors Erin Bennett and Filipino-American Kathleen Gutierrez filed a complaint with a state agency claiming that a faculty member created a hostile work environment and that the school did little to help them.